She loves me, she loves me not, that's so Daisy. You want to prove it's true love, you show up with a bouquet of roses. There's a plethora of flower vendors at Seattle's Pike Place Market, but most of them are into locally grown tulips. There are sophisticated flower shops all over town, too, and they'd be happy to sell you roses. At FloralMasters, a Seattle florist with a shop inside a major downtown office building, a vase filled with a dozen long-stemmed red roses runs $100, but they also sell a variety of colorful bouquets for a lot less. And they deliver. The veteran online merchant 1800flowers.com is also getting ready for a really big day. Their promotion this year is purple roses in a purple vase, 24 stems for $68. But if you're an Amazon Prime subscriber (rate just went up, to $12.99 a month), you can get a great deal on long-stem red roses at Whole Foods. 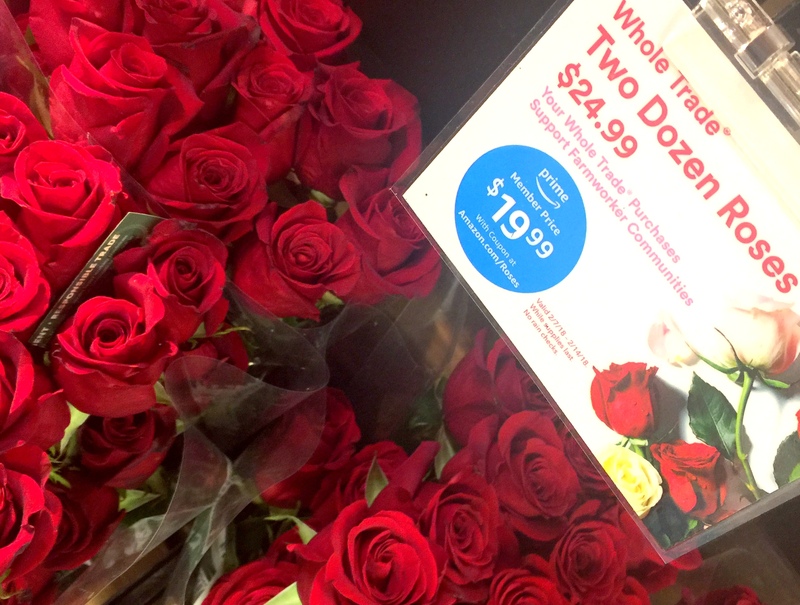 Two dozen roses wold normally cost $24.99, and this week (until Valentine's Day) they're $19.99. The link for the 20% off coupon on the Whole Foods page takes you to the Amazon.com website. And Amazon sells roses from a dozen other vendors as well. Roses and carnations, red and white, rainbow bouquets, rose hips for tea, rosé wine, dried rose petals, chocolate roses, rose plants, roses covered in gold leaf, and finally pork brains in milk gravy made by a company called Rose. "Here, honey, for you. By the time I got to the flower shop, this was all they had left." On the positive side, they're American-made (Sanford, NC) and gluten-free. On the other hand, well, there's really no excuse. This page contains a single entry by Cornichon published on February 9, 2018 2:55 PM. Brawk! Pasturebird Chickens Join Crowd Cow Lineup was the previous entry in this blog. Idaho's Famous Potatoes Making Way For Idaho Grapes is the next entry in this blog.